Friday in Bethlehem was a full, rich, and hard day. 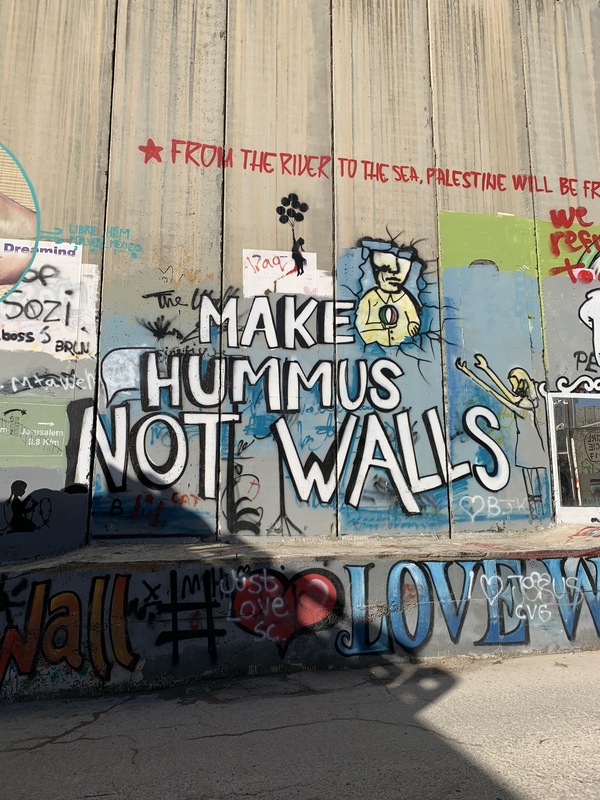 We began with a visit to a portion of the Separation Wall between Jerusalem and Bethlehem covered with murals and graffiti, the art of resistance. We then visited the St. Vincent Creche, an orphanage where we visited with its director and dozens of children, and shared mass together there. Before lunch, we went to the Daral-Kalima University College of Arts and Culture to hear a presentation that was both stirring and extremely informative about the situation in Bethlehem for Christians, as well as about the facts on the ground about resources of land, water, electricity, etc., for Palestinians throughout the region. After lunch we visited the Shepherd’s Field, and sang and prayed in the cave near where the shepherds likely heard the announcement from the angels about the birth of our Savior. After the morning, it was good news many of us needed to hear. Ryan was very popular at the Creche! 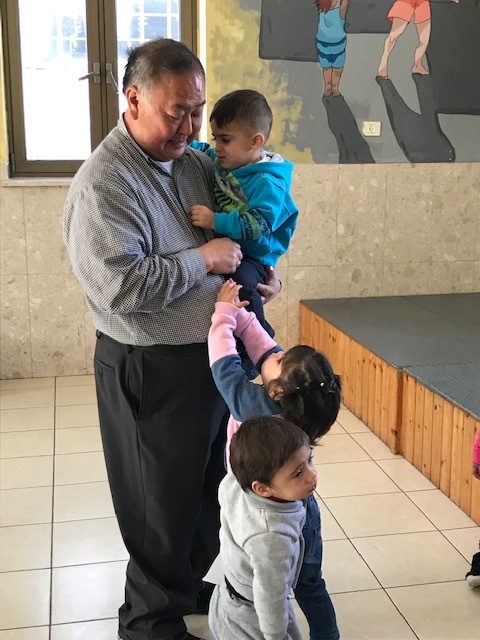 Elizabeth Schroeder has written a separate post about the experience at the Creche. Stephen Cherry blogged about his experience of our day here. What follows are some words from our many reflections on this intense day. Jesus’ perfect love casts out fear. It’s just jolly hard to get hold of perfect love. The sea is so vast and my boat is so small. It’s a very different sea from Galilee. The news all feels really bad, but there’s something hopeful about a room full of Americans hearing it, listening and witnessing. There is an element in all that we saw of the tragedy of some people’s desires leading to others’ suffering. Seeing the things we’ve seen here (the separation wall, the discrimination, the economic disparity) makes it easier for us to recognize it at home. 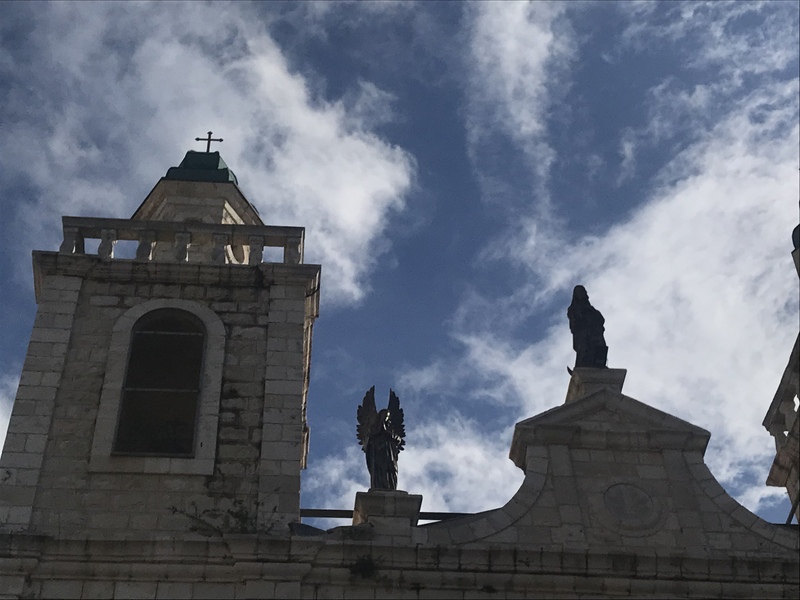 We’ve been following Jesus on this pilgrimage, but it also seems like we’ve been following Mary. We began the day in Nazareth and ended on the Sea of Galilee, the weather changing as often as our location. The end of the day was lovely and full of light, and our pre-dinner sharing felt the same. Heidi McElrath shared her experience and I asked her to write it down to share with all of you. When I was young, I remember being told that Mary was also young. When I’ve been scared, I remember being told that Mary was also scared. When I’ve talked of my desire to be a poet, I remember being told that Mary, too, was a poet. I always found comfort in the thought that God could take someone so weak — someone like me — and use her to enact salvation in the world. 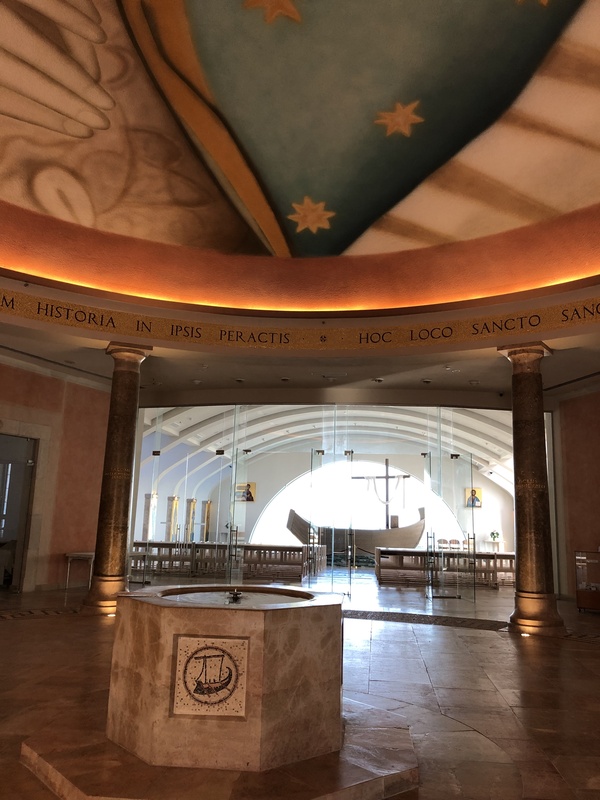 Today, we stood in the Basilica of the Annunciation, in the house where tradition holds that Mary was visited by Gabriel, where Jesus’s human body began. We dipped our fingers into the well where Mary collected each day’s water. We walked the land of Jesus’s formation—shaped, drenched, and witnessed by Mary. I have never known so significant or beautiful a space dedicated to the spiritual work of women. 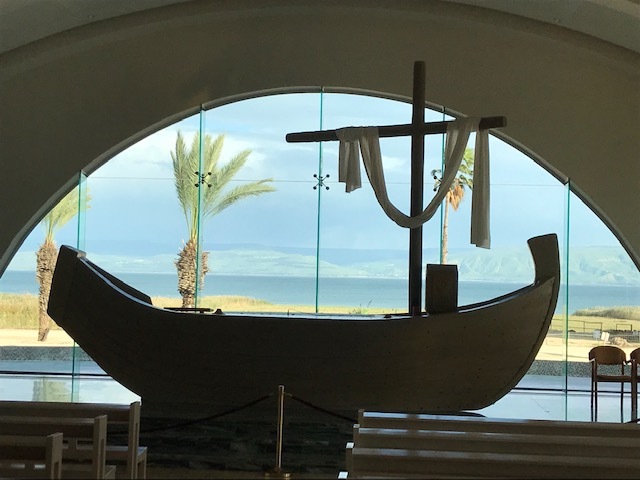 To stand on the holy shore of the Sea of Galilee in a room surrounded by the maternal pillars of our church was overwhelming. I have come to see that yes, Mary was a young, scared, poet of a girl, but she was also a bold, revolutionary thinker who worshipped a God who wanted to overthrow hierarchies and class systems. Mary was invested, even before Jesus was born, in feeding the hungry, taking down the mighty, exalting the meek, and she shared this with her son. This is the Mary who birthed Jesus, who taught him to speak and walk and live. This is the Mary who is our first example of the Christian life. 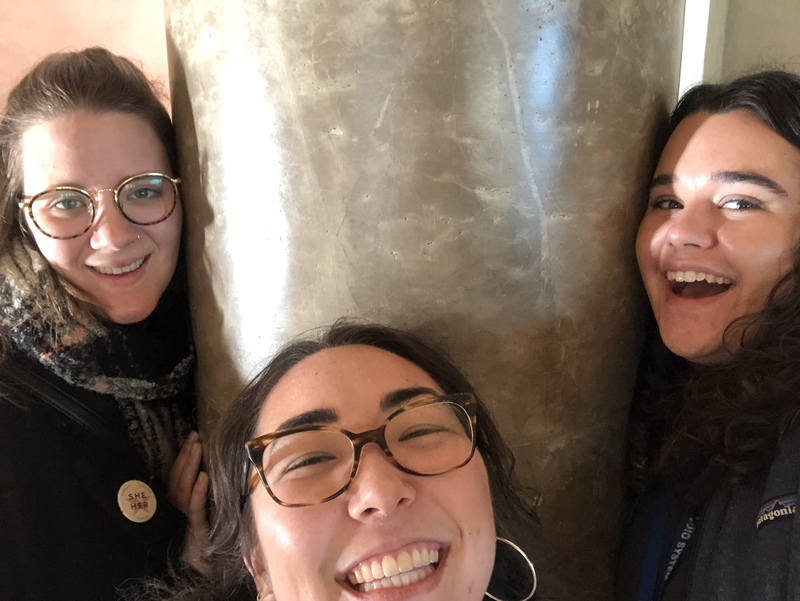 So with confidence, we three twentysomething women spoke loudly in this room of our mothers: Hail Mary, full of grace. Our Lord is with thee. Blessed art thou among women and blessed is the fruit of thy womb, Jesus. Holy Mary, Mother of God, pray for us sinners, now and at the hour of our death. I pray that we can see ourselves reflected in this bold, revolutionary woman, who formed our Savior, who was scared and young and poetic and helped God turn the world upside down.